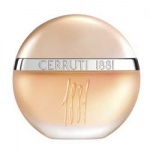 Cerruti 1881 Pour Femme Perfume for Women. Cerruti 1881 For Women is a sheer, woody floral that defines a new cool elegance as it wraps your senses with its linen theme and unique scent of sparkling flowers and pale woods. Cerruti 1881 For Women has a patented note of flax blossom that defines the fragrance and refers the wearer to the companies heritage. Cerruti 1881 For Women has a soft, airy and herbal character with hints of camomile, clean marine notes and woody base notes. The top notes include mimosa, bergamot, violet and freesia. These are followed by a burst of orange blossom, geranium, jasmine and rosewood. Cerruti 1881 Pour Femme ends with a woody accord of sandalwood, cedar wood, amber and musk. A modern classic fragrance easy to wear during the day, but sensual enough for the evening.1881 evokes the sensation of fresh air and the feeling of crisp linen, Cerruti's favourite fabric.